Information derived from MCBUL 1200, parts 2 and 3. The landing support specialist is also trained in the application of Automated Information Systems (AIS) that are utilized throughout the Defense Transportation System (DTS) to track and interface movement data with load planning programs and joint AIS to support the Force Deployment Planning and Execution (FDP&E) process; In-Transit Visibility (ITV) noncommissioned officers (NCOs) and Staff NCOs plan, conduct and supervise landing support operations and training. At the MAGTF level, landing support specialists assist with the throughput of unit personnel, supplies, and equipment. They also assist with the preparation, planning, and execution of strategic mobility plans in accordance with the Time-Phased Force Deployment Data (TPFDD) used to deploy and sustain forward deployed forces. Must possess a GT score of 95 or higher. Must possess an MM score of 100 or higher. Must complete the Basic Landing Support Specialist Course, Logistics Operations School, Marine Corps Combat Service Support Schools at Camp Johnson/Camp Lejeune, NC, upon entry or lateral move at the rank of Sergeant or below. Sergeants making a lateral move must also complete the Landing Support NCO Course, Logistics Operations School, Marine Corps Combat Service Support Schools at Camp Johnson/Camp Lejeune, NC. Non-MOS qualified Reserve Marines unable to attend the regular formal school course may be certified for MOS 0481 as an AMOS-only by the unit commander upon successful completion of the Alternate Training Instructional Program (ATIP) of the Marine Force Reserves. 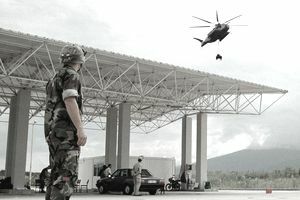 The ATIP for MOS 0481 Marines is found in Force Order 1535.1 and consists of core tasks to be performed to standard at the Reserve Basic Landing Support School, Mobile Training Team (MTT) or MOJT. A minimum of six months MOJT while assigned to a MOS 0481 billet is required. The Dictionary of Occupational Titles standardized occupational information to support job placement activities. To properly match jobs and workers, the public employment service system requires that a uniform occupational language is used in all of its local job service offices. In the Marine Corps, credentials, such as certifications and licenses, are part of training. Credentials show that you meet important standards in your USMC job, but also that your skills are on par with those required in the civilian world. Credentials help you translate your military training and experience into resume-ready qualifications that employers can easily recognize. Having the credentials that are required for jobs in your field makes you more competitive in the job market and more likely to get hired. It makes transitioning back to civilian employment smoother.